I love my OtterBox Defender iPhone case even though I wish it was more sleek and feminine. What it lacks in fashion it makes up for by saving my iPhone from total destruction nearly every day. My case needs to have a bit of a rubber-sticky feel so it’s easier to grip and it must protect from the inevitable two or three mishaps (aka drops) a day! I have a boring black case – partly because I carry it on my lap all the time (Brent thinks it is less noticeable) and partly because I can’t decide between the black, blue or pink (there are other colors too). Don’t get me started on my indecisiveness, there’s a post coming on that subject as soon as I decide to finish it! I can’t justify the nearly $50 each for a wardrobe of case colors, but if I had one other color, I’d pick the blue as a back-up. What do you think? One sleepless night when I was laying in bed listening to my iPod, I used my teeth to position my phone in my hand so I could change the podcast. Low and behold I heard a faint ‘crack’. The next day Brent took a look at my phone and said, ‘You have a crack across the glass on your phone!’, I was aghast and wondered how in the world something like that could happen! Not wanting to go to the Apple store and beg or use every manner of my wheelchair influence to finesse a free or reduced price replacement or much less pay full price to replace the glass front of my iPhone; we looked more closely and found that it was only my OtterBox case that was cracked! OK, it was a nearly $50 investment, but at least I wouldn’t have to go to the mall (yikes) to the Apple Store to get on the list, wait, and potentially buy more accessories or a new sweater at Ann Taylor next door. I quickly called OtterBox and they asked me a few questions which I reluctantly answered honestly! And the next thing I knew they were sending a brand-new OtterBox Defender free of charge! Their warranty is extensive and user-friendly. The new case arrived within ten days. Meanwhile, I cautiously used an old Otterbox case that was not made for my iPhone version. Impressive response and outstanding customer service. Otterbox ROCKS! – I’ve dropped it from a height of 3-5 feet on to concrete, tile, wood, etc. – I’ve rolled over it with all 350 lbs of me and my power wheelchair but really don’t want to do that again! – Tahoe has picked up my phone off the floor and run around the backyard with it more than one time. The stinker…he gets so proud of himself. – Last night I dropped my phone on the floor in the kitchen while we were engrossed in eating strawberries with freshly made cream cheese frosting (big kudos to Brent for his first experience and success making this staple). I’m sure Tahoe tried to give it to me, but when I licked the spoon and spatula clean there was no sign of Tahoe or the phone. Uh oh! In comes Tahoe, but there was no sign of the phone in the house or the yard. Our last resort was for Brent to call my phone…we listened for the barking dog ring tone….no, not in the house…hmm…we walk outside and hear a faint ‘ruff, ruff, ruff’ coming from the thick green bushes where Tahoe likes to curl up and relax. Alas, there lay my phone. If you are as clumsy as Madge or want to trust your phone with your 3 year old or your new puppy, give up your stylish case and get the OtterBox Defender! Great story about Tahoe hiding your phone. Flower has tried to carry mine off already. Wow Leta…how about that. I hit your family with a bullseye! Christina – I am right there with you…mine has flown off the car at 40 mph, stayed on top of the car for a mile at 60 mph, tumbled across the track at the YMCA while I was running and fallen too many times to count. 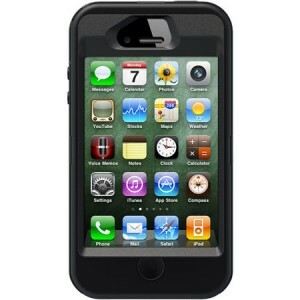 Otterbox rocks! I love the visual of Tahoe taking it to the bushes …that is so funny!!! That puppy is the best! 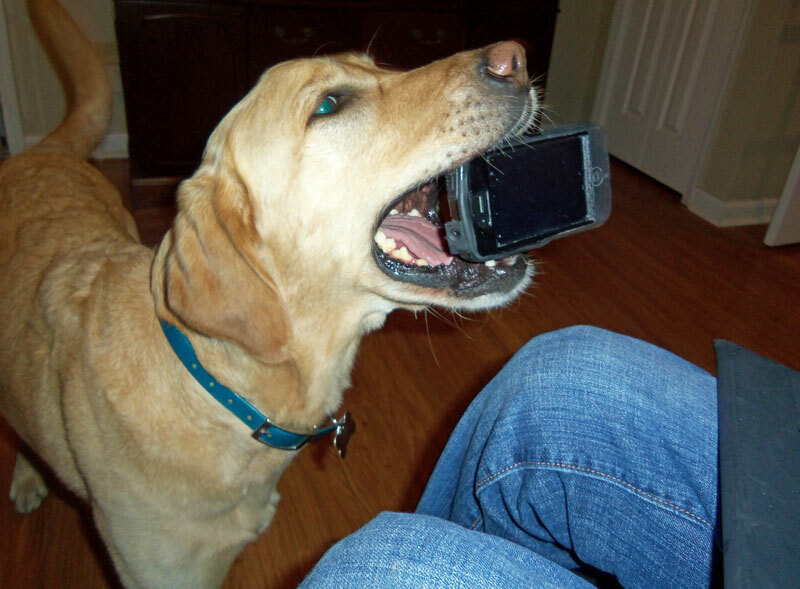 Lindsay – Otterbox is amazing! I called after the outer rubber part was torn and they sent me two new ones! LOVE hearing Tahoe stories 🙂 give him a hug from me, please!